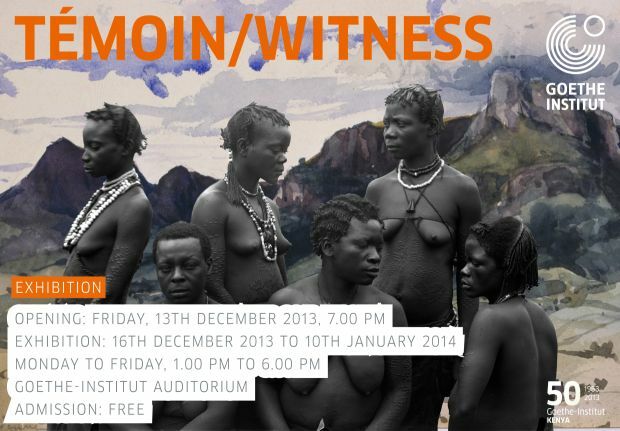 Témoin/Witness is an exhibition initiated by the Goethe- Institut South Africa and curator Simon Njami; co-curated by Sammy Baloji and Monique Pelser. It showcases the works of photographers who were involved in a Photographers’ Portfolio Meeting over a span of three years. The aim was to present their work within the portfolio reviews to several curators to gain critical feedback. The photographers included Sammy Baloji (DRC), Calvin Dondo (Zimbabwe), Sabelo Mlangeni (South Africa), Abraham Oghobase (Nigeria), Monique Pelser (South Africa) and Michael Tsegaye (Ethiopia). The exhibition speaks about the social issues, ever-changing past and present and inherited cultures across the African continent. It represents how this group of emerging photographers perform the role of onlookers, and actively survey their immedate environments. The works then become historical records and evidence reflecting the constantly shifting history, inherit cultures and social issues that span across the African continent. Sammy Baloji, born 1978 in Lubumbashi, D.R.C, lives and works in Lubumbashi and Brussels, Belgium. Calvin Dondo, born 1963 in Harare, lives and works in Harare, Zimbabwe. Sabelo Mlangeni, born 1980 in Driefontein, lives and works in Johannesburg, South Africa. Abraham Oghobase, born 1979 in Lagos, lives and works in Lagos, Nigeria. Monique Pelser, born 1976 in Johannesburg, lives and works in Cape Town, South Africa. Michael Tsegaye, born 1975 in Addis Ababa, lives and works in Addis Ababa, Ethiopia.